Ever since reading Barbara Kingsolver’s 2007 book, Animal, Vegetable, Miracle four years ago, I’ve kept in mind the last line of her book (spoiler alert): “What does a farmer eat in the Winter? Everything.” The premise of the book is growing and preserving your own food so that you can enjoy it in the darkest days of Winter, when nary a green sprout can be found in Virginia. Kingsolver takes it a bit to the extreme – dedicating a year to “food life”, something I doubt any of us suburbanites could undertake, what with our jobs, kids, mortgages and two cars. But her book takes us through the foods that arrive in turn as seasons march from Spring to Summer to Fall, and what it takes to cultivate and keep that food for Winter. In the years since, I’ve expanded my knowledge to understand what foods are seasonal and local. I’ve thought about what my suburbanite lifestyle can bear when it comes to gardening, and really it’s been no more than herbs. But in the back of my mind, I’ve wanted to preserve the harvest. I actually get a bit anxious looking at all the fresh vegetables and fruit at the Friday McLean or Saturday Vienna Farmers Markets each week and think about how I’ll crave a taste of Summer when it’s 32 degrees. And really, it seems irresponsible not to ensure I have my food store for the winter (see: Aesop’s Fable, The Ant & the Grasshopper – ironic in our house, because our daughter lately is obsessed with the Pixar movie, “Bugs”, based on this tale). Yes, I know there are grocery stores, but it won’t be local, fresh food. And there’s a connect with our ancestors about cultivating and storing food that keeps us tied to our past, and to our food. I just didn’t know where to start when it came to keeping food. And how would I have time with a three-year-old and a newborn? Fortunately, I have a good friend here in Vienna who regularly cans her own food. 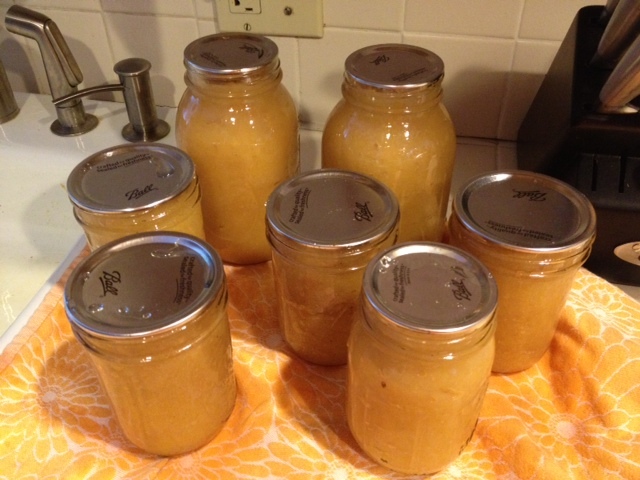 We canned apple sauce last Fall, which was my first foray into the hot, time-consuming process that is canning (putting food into glass jars and sealing them in with heat). We went together to the Vienna Farmers Market last Saturday and bought 12 pints of blueberries. Over $50 on blueberries! 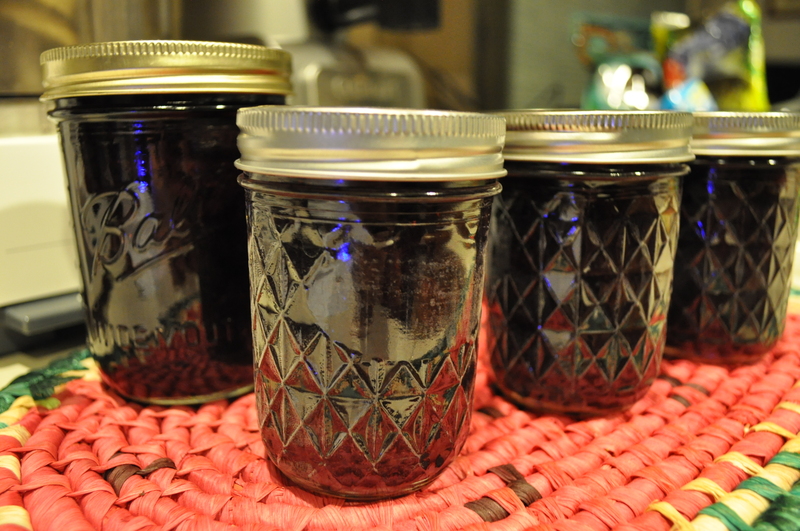 Then on a hot night, when poetically, the AC in her house had broken, we made loads of blueberry jam. We talked about how people did this “back in the day”, in this kind of heat all the time. 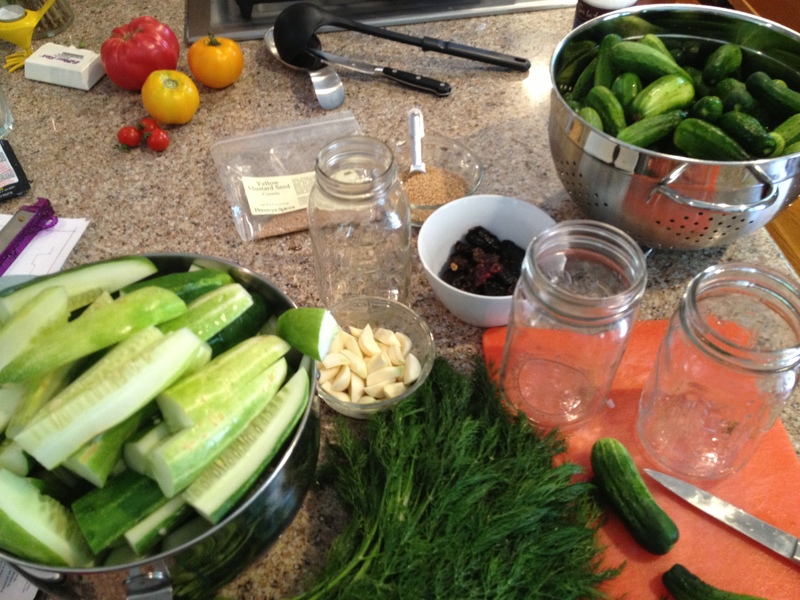 I thought of all the things people knew how to make and preserve by pickling, fermenting and canning. So much knowledge. Last week we made pickles! We bought nine pounds of pickles. We fermented six jars, which is easy-peasy. We heat canned six more, which is hot, hard work. It cost me $10 in ingredients to make six quarts of pickles. Many of us have lost the knowledge of how to preserve the harvest. Many of us have even lost the knowledge of basic cooking. Fixin’ to make a whole lotta pickles. A new friend of mine, who is launching Grow Your Family Strong, loves to make her own yogurt. That used to be something nearly everyone did “back in the day”. But who has time, and the knowledge? Another acquaintance of mine, Jennifer McLaughlin, is a local expert on fermenting and healthy eating. She’ll be sharing her vast knowledge at the Wednesday Oak Mar Farmer’s Market starting in the Fall. It seems so quaint, but these are great ways to create food that you know is delicious and healthy. No guessing about where it came from, how far it was shipped, or whether it’s genetically modified. Can we take back control of our food and preserve nutrition? I think we can. You can to. Try this super easy fermented pickle recipe from the book, Nourishing Traditions by Sally Fallon. It’s a no-brainer. You can do it! Wash cucumbers well and place in a quart-sized, wide-mouth mason jar. Combine remaining ingredients and pour over cucumbers, adding more water if necessary to cover the cucumbers. The top of the liquid should be at least one inch below the top of the jar. Cover tightly and keep at room temperature for about three days before transferring to the fridge where you can then eat at will. See how the flavor changes in the days that follow, but know you are getting healthy probiotics in this fermented snack! If you decide to use sliced cucumbers, slice at 1/4 inch segments and follow the above recipe, but put into the fridge at day two. An update: I’ve learned that for the pickle recipe above, you actually don’t need to use a whole extra tablespoon of salt if you don’t use whey. Glad to hear it, because these pickles came out so salty that I really don’t want to eat them. Next time I’ll use less salt!